Well it's been a while since I originally played around with the CCCLD and it wasn't till I felt the rod again in the form of the Blank that was a prize in this years Championships that I decided to get a new one for my own collection. 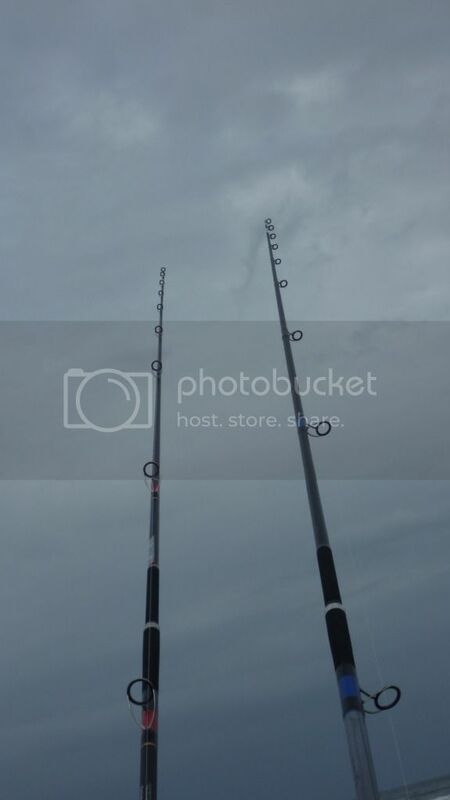 Overall rod length is 13'6" plus reducer allowing for a 14'6" plus overall length if prefered by the angler. 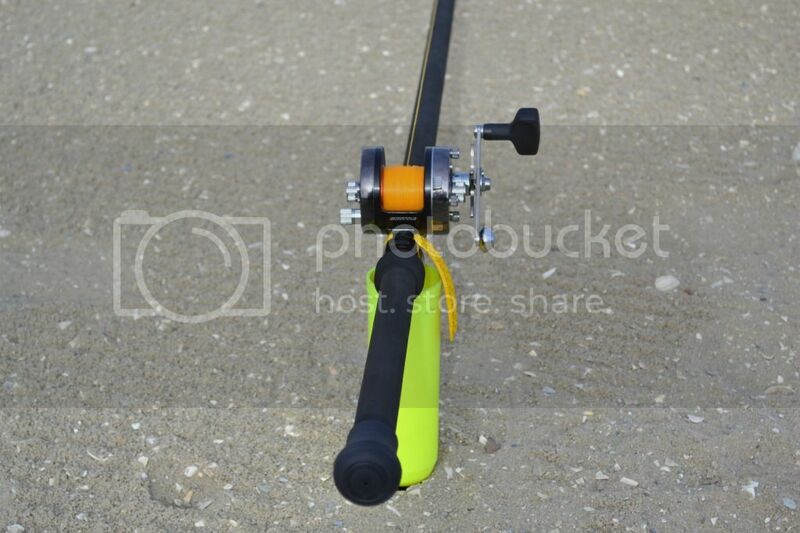 Rod weight excluding reducer is 750 grams with a set of Fuji "K' guides and adjustable reel seat. Bindings are black overbind with blue underbind on the lower two stripper guides , tip section guides are simply overbound. Overall appearance is very pleasing to the eye and the rod feels well balanced for this old bloke. 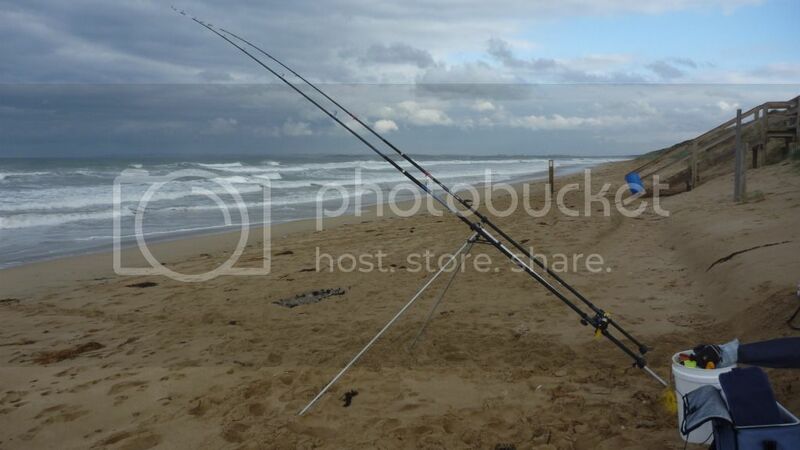 As I haven't been feeling the best I could only manage a very short stint down on the beach during my lunch break so I don't have any video footage to show of the rod at this point though I will go over some of the points that i like to check out on the rods that I use. As the rod is designed for a multiplier I was wanting to ensure that the stripper guide was set to allow an unrestricted flow of line from the reel. the photo below shows the line position after a cast that has the line load reasonably low on the spool. I must say that the few cast that I did with the rod was a pleasure as it loads with ease and sent the 150 gram lead out well even though I was casting into a head wind , recovery is sweet and allows for a relaxed casting style off the sand with no noticable kick . The rod as mentioned is light and winding in showed that it it didn't put undue pressure on the arms for which I was gratefull as I still haven't recovered from the tendon damage that I have done to myself. 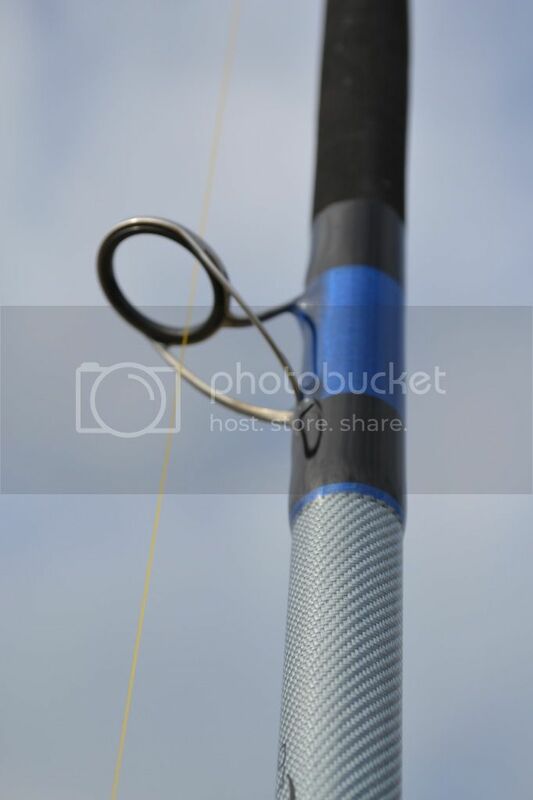 The loading of the rod indicates that it will register bites reasonable well but not as well as some would like with the tip being left at a reasonable thickness to handle the range of leads that it is rated too ( 200 gram+ bait ). I would prefere to see the rod being used with the lighter 150 gram leads as this felt sweet for me but I will give it a good run with the full range of weights and assorted baits in the coming weeks and provide feedback on that . Casting for this short session was done with my Akios 555 Shuttle with an additioanl N52 mag fitted and all break blocks removed , the rod looked good with this reel and felt good as well with overall weight not being a problem. Sad to say that i could only have a few casts on this first outing as health, weather and work wont allow me to get out again till the weekend so will just have to make do till then. I am hoping to head out on Sunday morning for a fish if the weather is reasonable and try and score a few fish on the rod but we will have to wait and see how that goes. So as a first impresssion I am very happy with the revisit to this rod and must say that I am quite happy with the way it looks and feels with the "K" guides as well. Just as a bit of reflection though here is a short video that I did with a mates rod a number of years ago ( 2007 ). At this time the rod was set up with the BNHG guides and matched to an Okuma reels which performed very well. More video and reports to follow once I get my PC and video editing software sorted out. 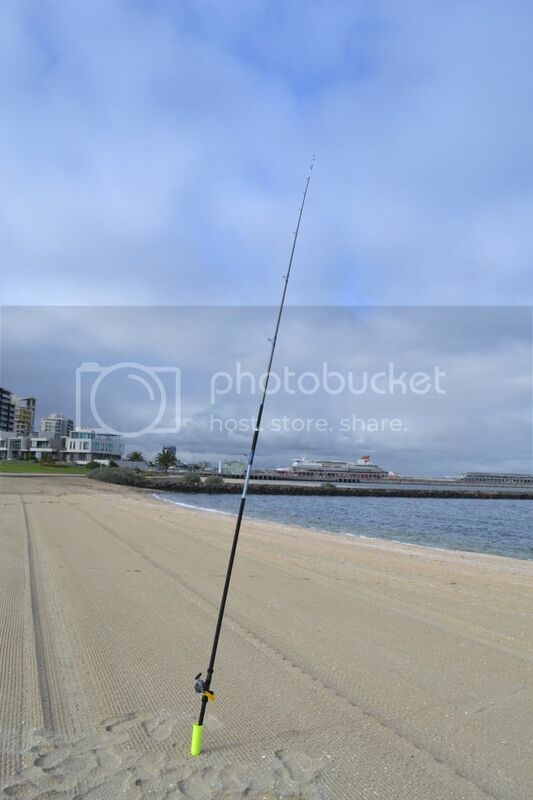 Well despite protest from my good lady and the threat of a wet and windy Sunday morning I headed down to 13th beach in the hope of blooding the CCCLD on a few Salmon before then heading over to south Barwon reserve for a casting session with a few of the guys. The drive down was put back a little bit due to a late night out on the town and that proved to be to my advantage as the rains had cleared and the roads were relatively dry and I still had time to arrive before the forecast high tide at 10.20 am. The sight that greeted me as I pulled up along the beach wasn't the best with a reasonable swell running and a fair bit of sand being turned over as well . Thankfully the beach was basically clear of any floating weed so i thought that I would still be in with a chance. Wind direction was from the east , south east which didn't bode well for this area but since I was down I decided to sling the baits out. The reel mnatch to the CCCLD was one of my penn 525 Slidy mags that I have had for a long time now and I was confident that it would match up well to the new rod. Additionally i had also purchased a new factory finished Tip Tornado low diameter super match as they are one of my prefered clean beach rods. For the TTLDSM I had that paired up with the lighter Penn squall 12, both reels were loaded with Ultima Powersteel in 15 and 12 pound respectively and as per usual a plaited double to my shock leader of 60 pounds. My intention was to target the Salmon and therefore the rigs were set up for that, being a pullety rig to a 2/0 circle hook with some floatation beads and baited up with a pipi and squid strip as well as some salted blue bait to try and cover most options. sadly no whitebait has been available from my regular source so I had to content myself with the other stuff. I had the 5 oz on the CCCLD and initially decided to send that out behind the breakers in the hope of finding cleaner water and the possibility of something bigger, but this proved to be the wrong thing as the rougher conditions had exposed the reef bottom and the snagging proved to be a big hassle. I therefore contented myself with keeping both rods in closer and focussed on the deeper gutter/whole at around 60 meters. 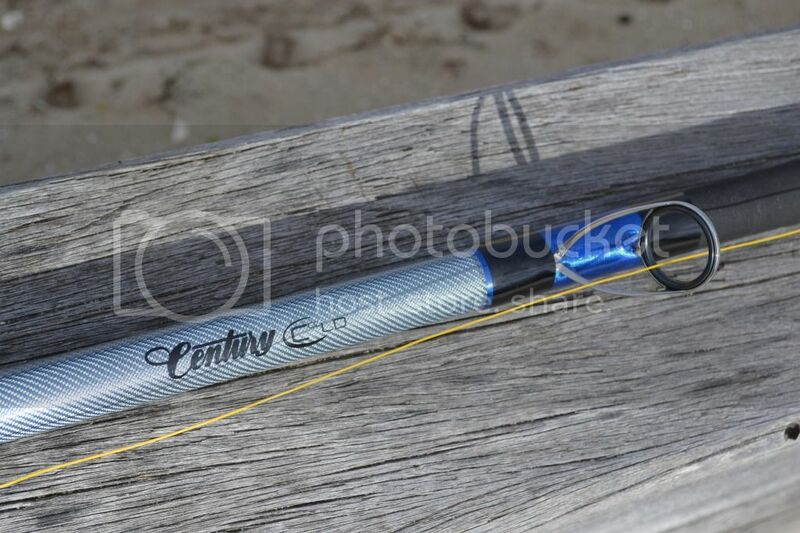 The casting capabilities of this rod a good and very comfortable with a gentle fishing pendulum sending the rigs out with ease. Additioally the softer overall action ment the risk of blasting the baits off was also lessend. I should at this point note that the tip of the CCCLD has the more standard tip diamter and that combined with the graphite construction impacts on the way the rod registers bites. A number of anglers like to see the tip of the rod flex as the bite is registered , as per the TTLDSM which has a fine diameter tip and a different lay up to facilitate this. The bite registration on the CCCLD is more of a rattle where the bulk of the tip flexes down giving more of a vibration registration that that of the tip flex. As you will see in the attached photo of the two rods side by side the diameter and taper of the rods greatly affect the way they register the bites. I should also point out that this isn't a real issue for me as I use circle hooks for the bulk of my fishing and the fish are generally hooking themselves anyway. Sad to say that even though I fished through the top of the tide and the first hour of the change all that I could show for my efforts was some small fsh stealing the pipi baits and tearing up the squid strips. 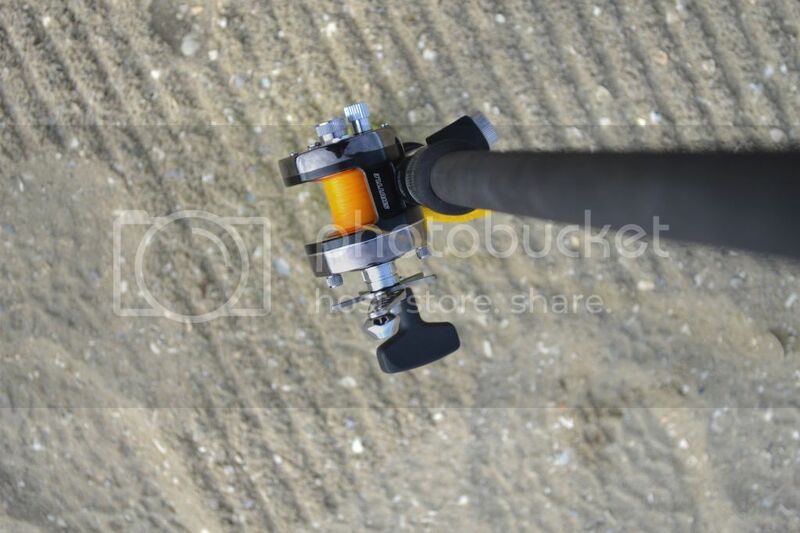 Still it was a pleasure to be out on the beach and using both of these light rods. It will now have to wait a fortnight before I can head out again as we will be having the June interstate comp next weekend where hopefully I can improve on my PB's .